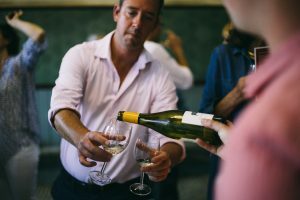 Early evening light shone through the Stable Yard as guests arrived to the welcoming faces of Debbie from the Wild Wine Club and Tommy and Josh from Emerging Vines. This knowledgeable and passionate duo guided us through the evening with informative and entertaining dialogue on each pairing, whilst Debbie and her team effortlessly attended to guests. 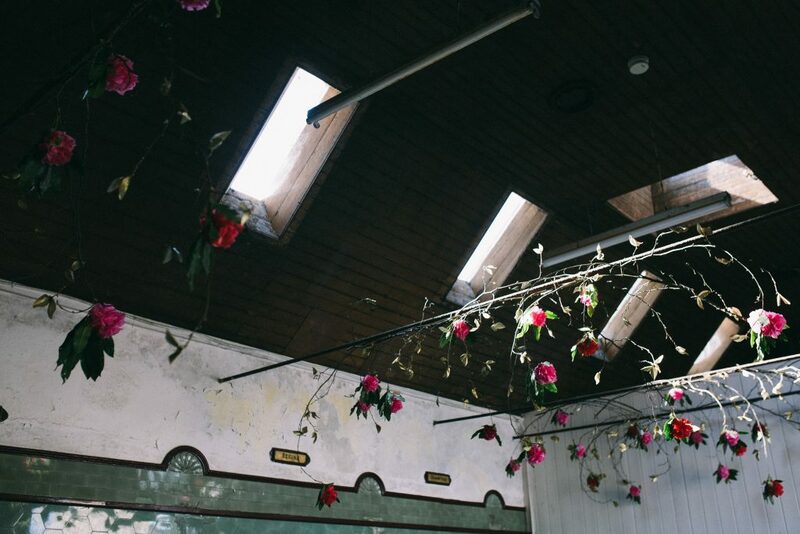 The rustic ‘Beaters Room’ was adorned with intricate paper flowers cleverly crafted by Vicki and Brigid of the Woodland Atelier to mirror the same beautiful flowers found on the estate. Alongside, an old bath tub was filled with colourful blooms whilst pillar candles twinkled and glasses clinked. 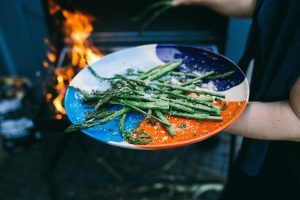 To start guests drank Trevibban Mill Black Ewe from a vineyard near Padstow with some delicious Cornish asparagus from Padstow Kitchen Garden; the perfect English summer combination. Next, guest were lead down the main drive past Boconnoc House and down a winding path to an opening filled with palms, ferns, wild flowers and most importantly an old marble bath. Debbie knew on her first site visit to Boconnoc how she could incorporate this amazing space into something rather magical. 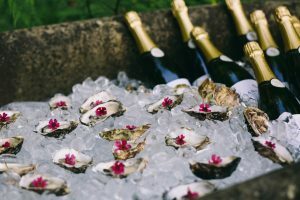 The marble bath was filled with ice that made a perfect receptacle for oysters and Langham sparkling wine from Dorset – much to the delight of our guests. Clever little bay leaf garlands decorated the marble bath by the Woodland Atelier, to keep the themes of understated natural beauty at the heart. A short amble to our next and final setting took our guests to the 18th Century Bath House, tucked away in the grounds of Boconnoc amongst wild flowers and gigantic rhododendron bushes bursting with pink flowers. Down the steps into the sunken stone bath, trestle tables filled the space decorated with flowers from the estate and a wonderful wreath took centre stage, again a creation of the Woodland Atelier team. 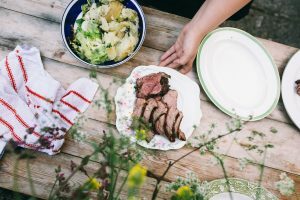 Our chef for the night Steve Boots (or ‘Boots’) was chargrilling succulent spring lamb over coals which were served alongside herby potatoes and greens. 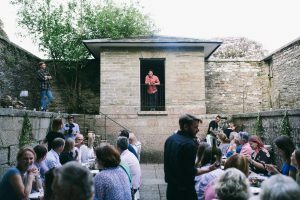 The dish was matched excellently with Sharpham’s Pinot Noir expertly introduced by Tommy of Emerging Vines from the Juliet balcony above. Cheese came next, namely Davidstow Cheddar with Stones Bakery sourdough and Cornish wild flower honey. To accompany this, we were treated to the Litmus Orange Bacchus, which not only was interesting in its processing but also in its colour. 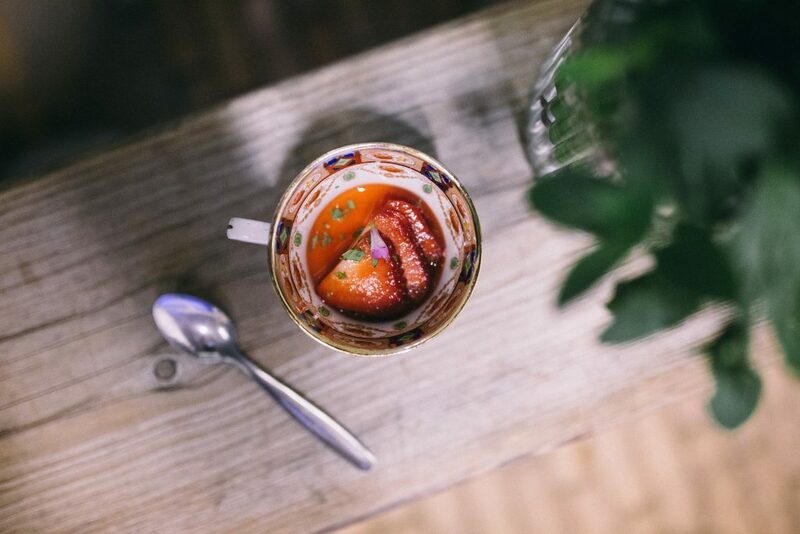 To finish guests tucked into a delicate set cream with sweet strawberries and sorrel served in dainty tea cups matched with Mena Hweg from our most local winery Knightor from just outside of St Austell. 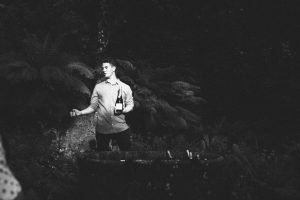 A huge thank you to Debbie of the Wild Wine Club for bringing her vision and magic to Boconnoc, to Tommy and Josh for their knowledge and insight into English wine, and to the Woodland Atelier ladies for their beautifully natural and elegant styling. Finally thank you to everyone who came to share the magic with us at Boconnoc.